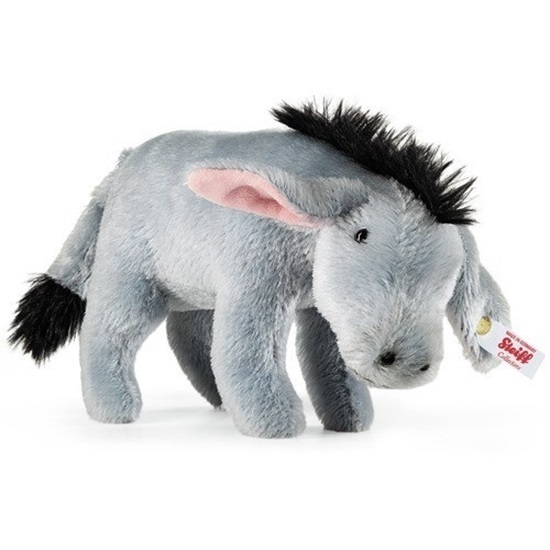 Joining Steiffs Winnie the Pooh series is Eeyore, a brilliantly insightful Mohair Donkey. Eeyore is non-jointed and sewn from a luxurious mohair, with a fluffy mane and tail tip. Eeyore is a character that you just fall in love with. Eeyore a true, loyal friend and a companion of Pooh Bear, the much loved iconic, honey eating bear created by AA Milne. Eeyore is 8 inches tall and non-jointed. He has been crafted from a decadent blue-grey mohair, with a fluffier black pile for his mane and tail tip. A pin attachment can clearly been seen, joining his tail to his body. With his large ears and head gently to one side, you cannot help but fall in love with his charms. This enchanting Donkey is a Worldwide Limited Edition of only 2,000 pieces and will come to you boxed, with his numbered certificate of authenticity.